Light Water (conventional water, as opposed to heavy water) Reactor Technology was developed initially for the U.S. nuclear submarine program. The earliest studies were performed at Oak Ridge. In 1948 this work was transferred to Argonne, and the bulk of the development was performed by Argonne and Westinghouse. 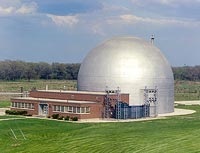 The reactor and systems designs were initially developed at Argonne. Westinghouse refined and implemented the designs, first in the S1W prototype at NRTS, and then in the Nautilus submarine reactor. Further development of Light Water Reactor Technology was based on experience from the naval nuclear program and on the series of Argonne experiments performed using the nine Argonne research reactors discussed below. 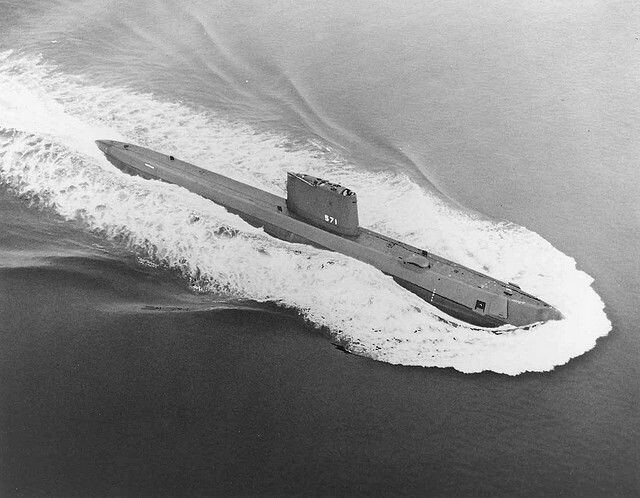 The pressurized water reactor (PWR) version of the LWR commercialized by Westinghouse generally followed from the nuclear navy experience. 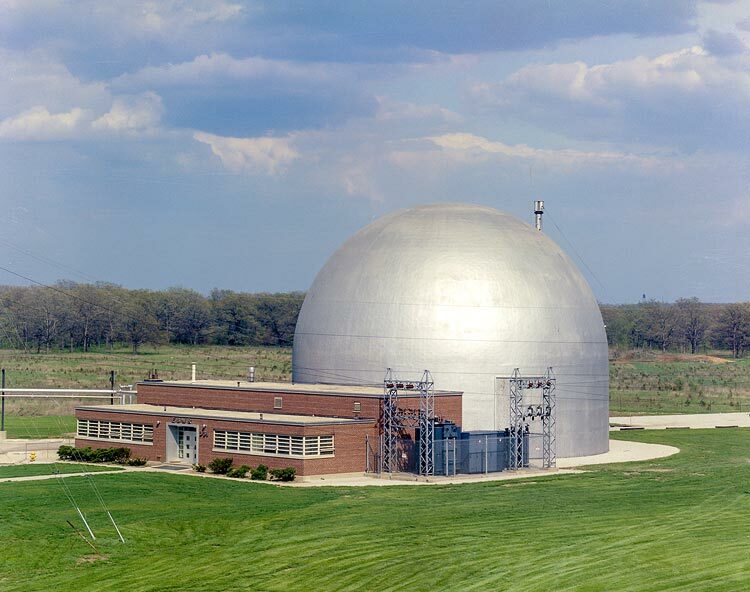 The boiling water reactor (BWR) version of the LWR commercialized by General Electric was based on concept development and the boiling water reactor experiments performed at Argonne. The first submarine reactor physics critical experiment. 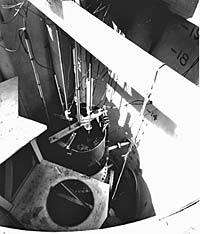 This reactor provided basic physics studies for naval reactors. One of Argonne's early assignments (Dec. 31, 1947) was to design a nuclear power plant for a submarine. The Naval Reactor Division (merged with the Reactor Division in 1952) was formed for this work. The result was the U.S.S. Nautilus, the world's first atomic submarine, launched at Groton, Conn., on January 21, 1954. Click on photo to view a larger image. Argonne, together with Westinghouse, developed the basic reactor plant design used in the USS Nautilus, the first nuclear powered submarine. Nuclear power had the crucial advantage in submarine propulsion because it is a zero-emission process that also consumes no air. The physics critical experiments supporting this design were performed at Argonne. This design is the basis for nearly all of the U.S. nuclear-powered submarine and surface combat ships, and was adapted by other countries for naval nuclear propulsion. The first actual prototype (for the Nautilus) was constructed and tested at the S1W facility in Idaho. 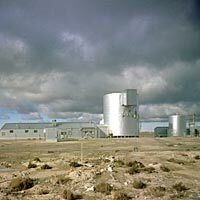 A picture of the BORAX-I reactor during an excursion. Click on photo to view a larger image. A closer view of a BORAX-I excursion, after the control rod was quickly removed from the reactor. Click on photo to view a larger image. In 1952, Samuel Untermyer suggested that direct boiling reactors might be practical. Previous to this time it had been thought that any bubble formation in the core would result in nuclear instabilities. Untermyer suggested that steam formation would actually help stabilize the reaction. 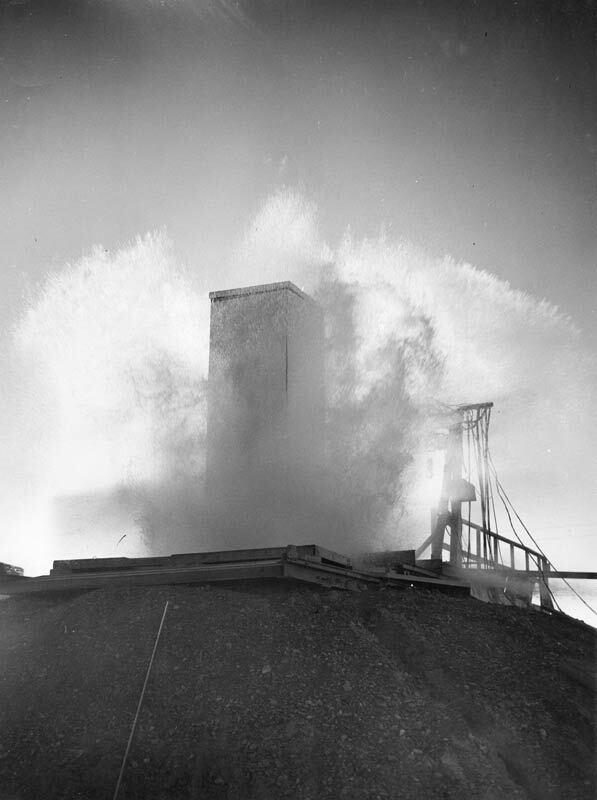 Accordingly, Argonne National Laboratory designed, built, and operated a series of experimental boiling water reactors on the National Reactor Testing Station in Idaho. These reactors were known as the BORAX (Boiling Reactor Experiment) series. The first reactor in this series, BORAX-I, was built in 1953. Its purpose was to experimentally determine the self-limiting characteristics of water-cooled reactors and the operating characteristics of boiling reactors. BORAX-I could only be used during the summer months because the reactor was not housed. BORAX-I was first used for steady state investigations on boiling water reactors. It was used to prove that the formation of steam bubbles in the reactor core did not cause an instability problem. Through the remainder of the summer and early fall, the reactor was put through a series of about 70 intentional "runaway" excursions and periods of steady boiling operation. These tests showed that the formation of steam and consequent water ejection from the core can provide inherent protection against the runaway hazard in suitably designed reactors of the water-cooled water moderated type. BORAX-I conclusively proved that steam formation is an effective, reliable, and rapid power-limiting process, capable of protecting properly designed reactors against reactivity excursions which produce reactor periods shorter than 5 milliseconds. The reactivity decrease caused by steam formation in reactors like BORAX-I constitutes an inherent, ever-present power-limiting mechanism. Results of the investigation pointed the way toward more economical power reactors through minimization of hazards, simplification of reactor design, and reduction of the temperature demands on materials. A picture of the inside of the BORAX-I reactor. Click on photo to view a larger image. It was proposed that, before its replacement, BORAX-I be subjected to a single, very quick, destructive excursion. The purpose of such an experiment was to determine its inherent safety under extreme conditions. After discussion with the AEC Reactor Development Divison and the Advisory Committee on Reactor Safeguards, it was decided that such a final experiment was worthwhile. The facility was deliberately destroyed in July 1954. Almost simultaneously with the removal of the control rod from the reactor, a dark grey colored column was ejected from the reactor to a height of more than 80 feet. 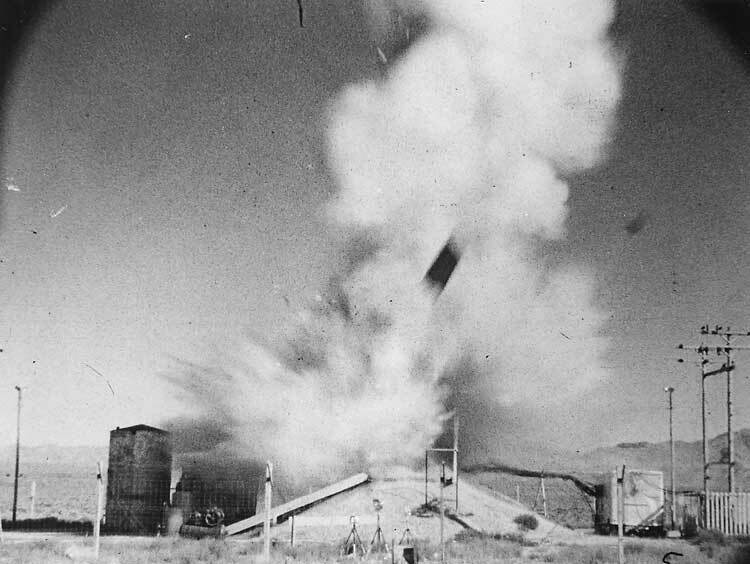 Shortly thereafter, the sound of a medium sharp detonation reached the control trailer which was located one-half mile away. Just prior to the appearance of the ejected material above the upper edge of the shield tank, a flash of light from the tank could be seen and was recorded by the high speed cameras. this flash lasted about 3/1000 of a second (0.003 sec.) and was extinguished before the first bit of water appeared above the earth shield. This flash, which was evidently of nuclear origin, was similar to those which had accompanied the earlier and less violent experiments. Fuel plate fragments were scattered for a distance of 200-300 feet, but no widespread dangerous dispersal was observed. The final BORAX-I experiment. Click on photo to view a larger image. The final test revealed that the predictions of total energy and fuel plate temperatures had been considerably too low. Instead of the melting of a few fuel plates, the test melted a major fraction of the entire core. The discrepancy was attributed to the uncertanties of extrapolation. The results of this energy liberation in the way of peak pressures and explosive violence lie in a region where there had been no previous experimental data. In this respect, the results were more informative than they would have been had the experiment been performed under conditions which actually gave the predicted energy release. 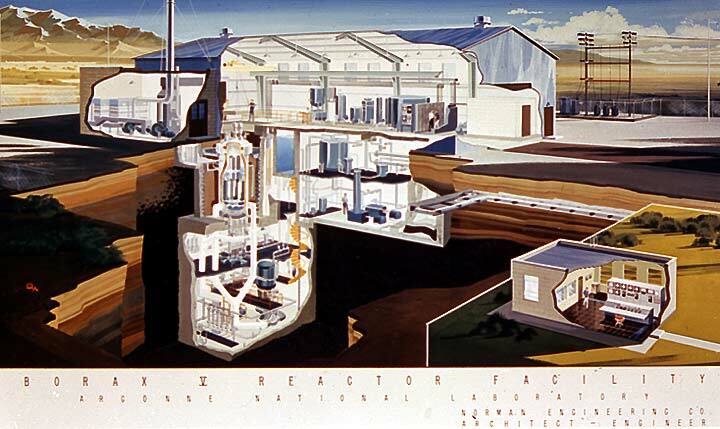 The BORAX-II reactor while in operation. The reactor was not equipped with a turbine generator, so it could not produce electricity. It vented the energy it produced in the form of steam. Click on photo to view a larger image. BORAX-II was designed, built, and operated by Argonne National Laboratory to replace BORAX-I to investigate a new reactor which would more closely approximate the characteristics of a practical power reactor operating on the boiling principle. BORAX-II was constructed in late 1954. Tests of new core combinations were tried using varying enrichments of uranium-235 in the metal fuel plates. It was a boiling water system operating at 300 psi, making it essentially a power experiment. The power level was about 6.4 MW(t), but since it had no turbine generator, no electricity was produced. The energy produced was released in the form of steam. 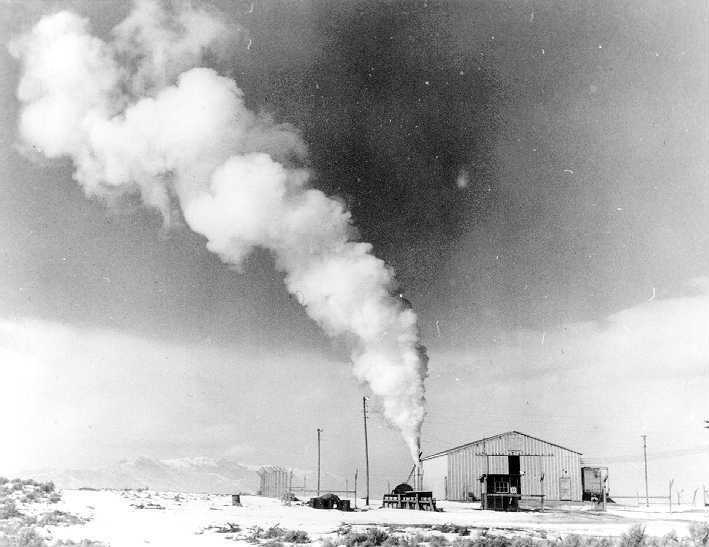 In 1955 a turbine-generator was added to BORAX-II and testing was done to demonstrate that turbine contamination would not be a significant problem in BWR's. 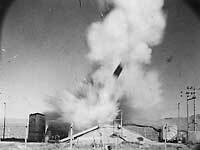 This testing was continued with BORAX-III. 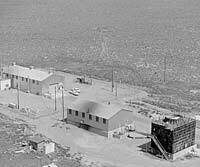 The BORAX-III reactor was the first reactor in the world to provide all of the electricity to an entire town. Click on photo to view a larger image. 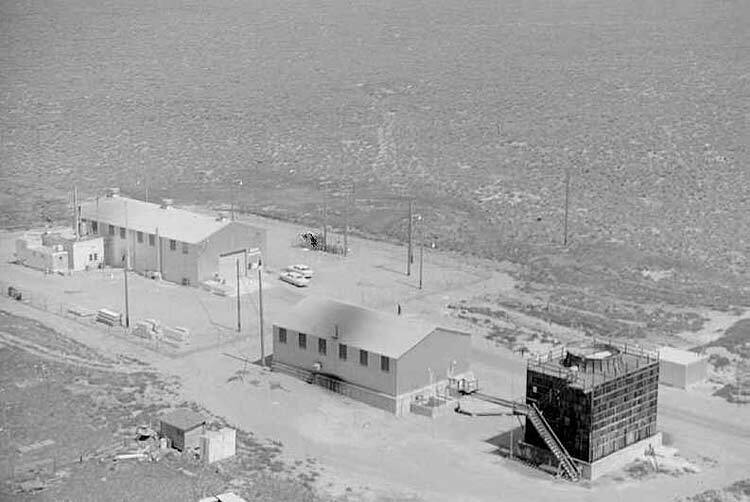 As a result of the BORAX-I and BORAX-II tests, Argonne undertook a program in March of 1955 to add a turbine generator to the BORAX reactor to produce electrical energy of the order of 2000 kW, enough to provide the town of Arco, Idaho, with complete electrical service. At that point in time, no city in the world had been powered entirely by nuclear energy. On July 17, 1955, electricity produced by BORAX-III supplied the town of Arco, Idaho with its entire supply of electrical power. For two hours, BORAX-III generated approximately 2000 kW of electicity, with 500 kW used to power the BORAX facility, 1000 kW used to power the Central Facilities Area at NRTS, and 500 kW to light the city of Arco, Idaho. BORAX-III became the first nuclear power plant in the world to generate electricity for an entire city. BORAX-III was used until 1956. The BORAX-IV reactor, which was the successor to BORAX-III, began operation at Argonne in December 1956. This reactor, with a design power of 20 MW(t), was used principally to test high thermal capacity fuel elements made from ceramics of uranium and thorium. 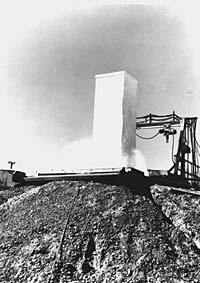 Like the previous BORAX reactors, BORAX-IV was a boiling water reactor operating at 300 psi. It was capable of producing 2.5 MW of electricity. The new ceramic core of uranium-thorium oxide fuel elements demonstrated the feasibility of stable operation with this fuel, which can operate at higher temperatures, is less reactive with water coolant in case of cladding rupture, is cheaper to manufacture, and has higher burnup posssibilities. It also produced measurable quantities of the artificial, thorium-derived fuel, uranium 233. 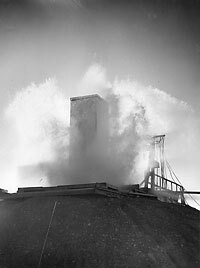 The BORAX-IV reactor was first brought to criticality on December 3, 1956 under atmospheric pressure, with water temperatures ranging from cold to boiling (93 °C at the elevation of BORAX-IV). It was operated with this core until April 17, 1957. Operation with a 59-element core at 300 psig and 216 degrees Celsius started in May 1957 and continued intermittently until December 5, 1957. The 59-element core was then revised in order to increase the maximum power for continuation of stability studies. The boron steel poison rods were removed and 10 new elements were added to the periphery of the core. On February 19, 1958, the reactor was started with the revised core. and area contamination downwind from the reactor. On the basis of these experiments, it was predicted that a boiling reactor, fueled with ceramic fuel, can safely operate for long periods of time with many fuel cladding defects. BORAX-IV operated until June of 1958, after which is was replaced by BORAX-V.
A cutaway view of the BORAX-V facility. Click on photo to view a larger image. In 1957, the idea for BORAX-V was conceived by the Reactor Engineering Division of Argonne National Laboratory. In 1958, a proposal to construct an extremely flexible boiling water reactor was submitted. The primary objectives were to test nuclear superheating concepts and to advance the art of boiling water reactor design. To do this, workers performed experiments which improved understanding of factors limiting the stability of boiling reactors at high power densities. The greatest departure in design for BORAX-V from the previous BORAX reactors is found in the superheater. 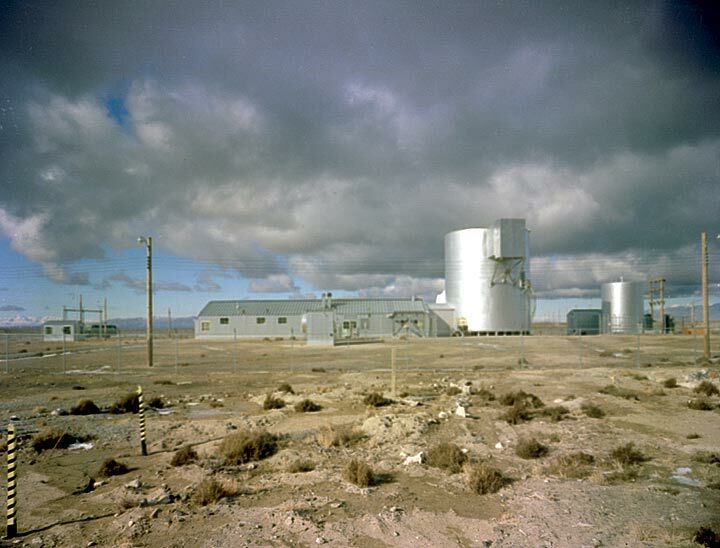 From 1962 to 1964, BORAX-V was used with an integral nuclear superheat system. The reactor demonstrated that improved efficiency from manufactured steam is obtainable by incorporating a number of superheat fuel assemblies in the reactor core lattice. This raised the temperature of saturated steam from 489°F in the core to 850°F of dry steam and raised the pressure to 600 psig in the superheat portion of the reactor. This increased cycle efficiency held promise of reducing nuclear power costs. Three separate core-structure configurations were tested in this flexible experimental facility. One of the parameters investigated in the BORAX-V experimental program was void formation (formation of steam bubbles) and its effect on reactivity, stability, and heat transfer. This is the mechanism that gives the boiling water reactor its principal shutdown mechanism. The BORAX-V reactor, containing a core with a peripherally located superheater, was successfully operated from April through August of 1964. This marked the first prolonged operation of an integral boiling water-nuclear fuel superheating reactor in the United States. Both boiler and superheater fuel performance in this core were excellent. The BORAX-V project was terminated at the end of August 1964. During the last weeks of power operation, experiments were conducted with prepared defective fuel samples. A final experiment in BORAX V demonstrated that negligible contamination to turbo-generator equipment resulted from operating with an experimentally defective fuel element in the superheat core. Termination left several portions of the originally planned experimental program unfinished. These included achievements of high powers and power densities with both central superheater and pure boiling cores, operation with forced circulation, fabrication and testing of advanced-design superheater fuel elements, investigation into the causes of instability in high-power density boiling and integral boiling-nuclear superheating reactors, and certain special reactor safety experiments such as flooding the superheater at power, and loss of coolant to the superheater. An outside view of the EBWR facility. Click on photo to view a larger image. In 1952, Argonne engineer Samuel Untermyer formulated the idea that direct boiling reactors might be practical. To prove this concept, Untermyer and other Argonne engineers designed, built, and operated a series of experimental boiling water reactors, known as the BORAX experiment series, at the National Reactor Testing Station in Idaho. Using the results of these physics experiments, they then designed and built a prototype boiling water reactor power plant, the Experimental Boiling Water Reactor (EBWR), in Bldg. 331 on Rock Road at Argonne's Illinois site. Operations with EBWR proved that a direct cycle boiling water reactor system could operate, even at power levels five times its rated heat output, without serious radioactive contamination of the steam turbine. EBWR, sometimes referred to as CP-7, was operated until 1967. EBWR, operated with a largely plutonium core, provided valuable information on plutonium recycle operation of water reactors—it generated plutonium-based electricity for Argonne's physical plant in 1966. When closed down the following year, EBWR had established a reputation as the forerunner of many commercial nuclear energy plants. One of those is the Commonwealth Edison facility at Dresden, Ill., which in 1960, became the first privately operated nuclear energy plant. An outside view of the ALPR facility. Click on photo to view a larger image. In 1954, the Army Reactors Branch of the AEC was apprised of a requirement for nuclear power plants to replace diesel generators and boilers as the primary source of electrical power and space heat at remote radar stations north of the Arctic Circle. Designs for low-power nuclear plants were solicited by the Army Reactors Branch. The reactor components were limited to "packaging" measuring 7.5 x 9 x 20 ft, and weighing 20,000 lb. Maximum use of standard components. Construction on permafrost (tundra) terrain. Use of local gravel for biological shielding. Minimum quantity of plant makeup water. Simplicity and reliability of plant operation and maintenance, with minimal supervision. Nominal 3-year fuel operating lifetime per core loading. The ALPR (redesignated Stationary Low-Power Reactor number 1, or SL-I) was closely related to the BORAX boiling water reactors. It was a 3 MW(t), highly enriched uranium-fueled, natural-circulation boiling water reactor, cooled and moderated with light water. The operating and control experience obtained by Argonne from the BORAX experiments were incorporated into the design. It was constructed at the NRTS site from July 1957 to July 1958. The thermal boiling reactor system operated at 300 psi using 90 percent U-235 in the form of a uranium-aluminum alloy. Electrical power and space heat was first generated by ALPR on October 24, 1958. It generated about 200 kW(e) plus 400 kW(t) for space heating. ALPR was dedicated in December of 1958. Shortly thereafter, the facility was turned over to the U.S. Army. From that point on, the army oversaw SL-I to monitor reactor reliability and to train operating personnel. On January 3, 1961, the reactor was destroyed in an accident.